Two new Resident Evil 5 Mercenaries Reunion gameplay clips showing off Chris and Sheva's alternate costumes in the upcoming Alternative Edition DLC display a ridiculous amount of bare skin. 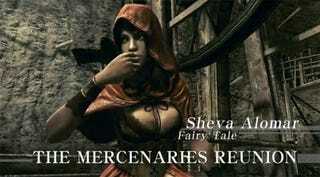 And Sheva's is pretty revealing too. Actually the costumes aren't too shabby, though Chris could use a messier hair style to go with the warrior look and I pretty much got my fill of naughty Red Riding Hood costumes during Halloween this year. What bothers me the most is that my first thought upon seeing these two clips was, "That's not going to provide enough protection against a horde of zombie-like mutants." There is something wrong in my head.